- Mix wheat flour, baking powder and salt in a bowl. - Add 3 tsp of cooking oil into it and mix well to make crumbles. - Add your flavor in it and mix well. - Knead a soft dough using lukewarm water. - Divide the dough in 4 balls and roll them out in thin chapati. - Cook them on flat tawa for a min or two on both the sides. - Cover all tortillas with a damp kitchen towel to keep them soft. 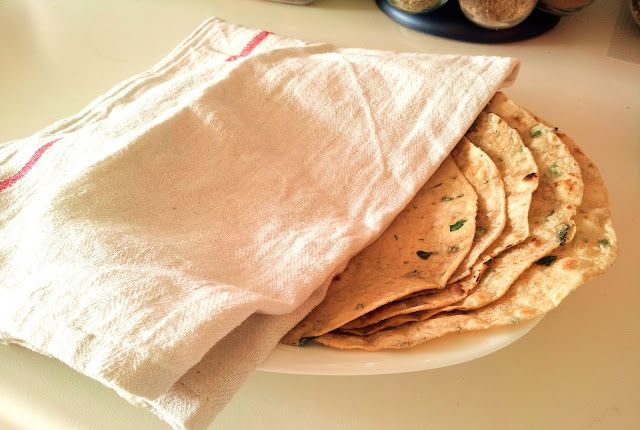 - Use these wheat-based tortillas to make varities of wraps! 1. Garlic and Herb - Crush garlic cloves and any herbs of your choice with few drops of olive oil. 2. Cinnamon n Sugar - Mix of cinnamon powder (a pinch) and caster sugar. 4. Lemon n Black pepper - Mix black pepper powder in lemon juice. 5. Tomato and Basil - Blend tomato and basil in mixture using water.